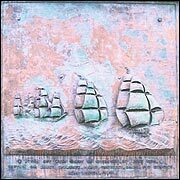 We look into what happened to the monument to Guernsey's most celebrated sailor and its planned rejuvination in 2009. Admiral Lord James de Saumarez died in Guernsey in 1836 after a long and celebrated career in the Royal Navy. To build a memorial to celebrate and remember his achievements money was raised through public subscription and the foundation stone for the monument was laid on 1 August 1876. 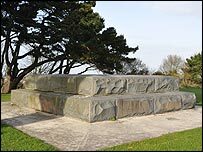 The 99 foot high granite memorial in Delancey Park was completed on 11 October 1877 and officially unveiled on 1 August 1878, the 80th anniversary of the Battle of the Nile where Saumarez had been second in command. On 7 December 1943 all except the base was demolished as the German Forces occupying the Channel Islands levelled many of the island's monuments and structures to clear fields of fire for their artillery batteries. In 1954, after a debate spanning more than ten years, the States of Guernsey decided not to replace the monument and instead place the bronze plaques, which had adorned the memorial, in the outer bailey of Castle Cornet. However, in 2009 a charitable organisation, the Admiral de Saumarez Trust, was set up to support community and island wide regeneration projects starting with Delancey Park, including the de Saumarez monument. Guernsey's Lieutenant Governor, Sir Fabian Malbon is one of the patrons of the Trust, he said: "Admiral James de Saumarez was one of the remarkable figures in Guernsey's history. After an exceptional career in the Royal Navy, he spent 25 years in retirement engaged in charitable work for the Island community and good works abroad. "Honouring him by creating a charitable initiative and reconstructing the monument is an appropriate way of bringing some of Guernsey's history back to life especially for young islanders." The new monument will feature the original bronze plaques which will be moved back from Castle Cornet to the park and is being designed by architects Cresswell, Cuttle & Dyke. Architect Andrew Dyke said "the proposed design will be a spirit of the original" adding, "it will be lit up with lights representing the constellations and stars with which the Admiral would have been very familiar for navigation purposes. "The monument will be clearly visible from many parts of the Island and from the Northern and Eastern approaches." 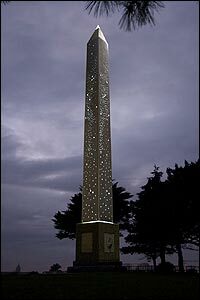 Though still subject to planning permission the Trust hope work on the monument will be completed in time for Liberation Day 2010. There were four plaques, one on each side of the memorial. One was a dedication of the memorial: "To James first Baron de Saumarez of Guernsey GCB, KS; DCL, Admiral of the Red, General of Marines, b.1757 d.1836. This memorial is erected by his fellow countrymen as a tribute of admiration to his heroism and Christian character. 1878." The others are a head and shoulders relief of Lord de Saumarez, a frieze of the action off the west coast and a list of victories at sea during his career from 1778 to 1801. Born on 11 March 1757, he was educated at Elizabeth College and entered the Royal Navy in 1770. As the captain of the HMS Crescent, with a crew of mostly Guernseymen, he captured the 36-gun French frigate La Reunion off Cherbourg in 1793. One of his most exciting Naval actions took place off the West Coast of Guernsey as the Crescent escaped a French squadron through the local knowledge of a Guernsey pilot. Saumarez was Nelson's second in command at the Battle of the Nile in 1798 where he was severely wounded. He led the Channel Islands' squadron when the islands were made a naval station in 1803 with a fleet including six frigates and six brigs. In 1801 he was made a baronet and a rear-admiral, making full admiral in 1814 following his time spent in command of the Baltic squadron. He was elevated to Vice-Admiral of Great Britain in 1821 and made a Lord in 1831. 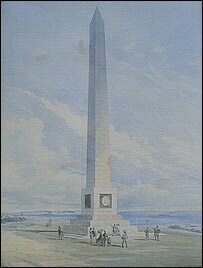 Reproduction of watercolour of De Saumarez Memorial signed A.C.A and dated 1874 is Courtesy of Guernsey Museum & Galleries, States of Guernsey, 2009.